Local rapper releases song about flowers. Alaskan Daisy is the latest single by Iqaluit-based music-producer Thor Simonsen – also know by his stage name, THOR. The song is an acoustic, rap-inspired song about a boy whose love for a colourful flower prompts him to take good care of said flower. 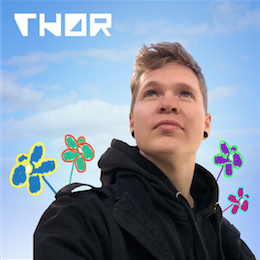 Thor, who created the song entirely by himself (including the cover art), has previously worked with many other prominent musicians. He began his musical career as a rapper and DJ in Scandinavia. His most recent project, the Nunavut-based pop-collective Ajungi ᐊᔪᙱ, was featured on national radio and received international acclaim. Alaskan Daisy is available for free download until Christmas Day. great intro to the song in written form Thor! Many great lines and always interesting through the entire 3 plus minutes! I wish the sound on my computer were MUCH MUCH better!